Cleanliness and fire safety are essential ingredients of every well managed kitchen. At the heart of the matter is your Kitchen Grease Extract System, the perfect landing place for grease, oil and other deposits. Regular Kitchen Canopy, Ducting, Extractor Fan and Filters cleaning is essential for maintenance, hygiene and fire safety requirements. 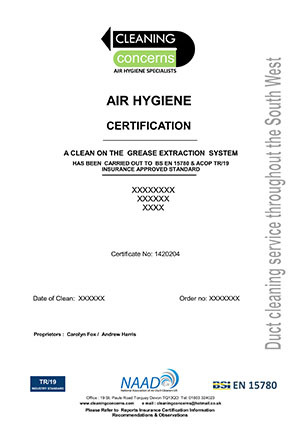 We cover Devon, Cornwall, Avon and Somerset. All work is carried out to the BESA TR/19 Industry and Insurance Standard and on completion a full Hygiene Report is issued including insurance certificate , pre & post cleaning photographs, wet film tests, cleaning methods and techniques for your record. Cleaning Concerns can take the worry out of your hands with an expert Kitchen Grease Extract cleaning service and air duct cleaning service that ensures you meet your fire safety and insurance obligations and minimizing the fire risk by removing grease deposits with regular cleaning programs which are devised to suit your individual kitchen needs. Whether you are a chain of restaurants, hotel, catering facility or a family run business our service can be tailor made to suit your cleaning and Insurance needs and with it comes peace of mind that you are insurance company compliant. Insurance Certificate on all work! Our work includes the certificate required by Insurance Companies, Health & Safety and Environmental bodies. We have been using your company for several years and are always prompt, reliable and carry out the work to a high standard. Highly recommended! We are very impressed with how they operate and carry out their service they are always highly professional throughout and I would not hesitate to recommend they services. N & E Fabrications Ltd.